The Reach has been named as the development of the year by the Kamloops Chamber of Commerce at their 32nd annual Commerce Awards of Excellence. Deb McLelland, executive director of the Chamber, provides some reasoning behind the decision. The criteria for the award, sponsored by Fit Financial, was for the project to be completed within the 12 months before the nomination submission and a general demonstration of a contribution or investment to the economic and social impact to the Kamloops region. 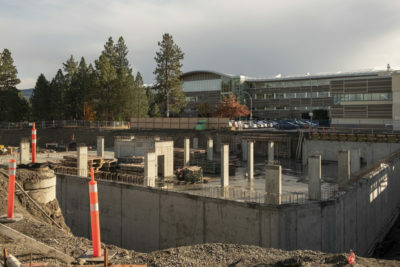 TRU first announced TRUCT as their corporate trustee in November of 2011, revealing they would be managing the mixed-use development of TRU’s real estate. The trust is engaged in commercial activity with a mission that includes making profits to be used for student financial assistance, research funding and other university initiatives. Brian Christianson, Stantec principal architect, shares his thoughts on the award and the impact The Reach has left in the community. He mentions the various benefits of the project from improving campus and student life, densifying the southwest side of the city, along with its distinctive goal to give back to students for their research endeavours. The Reach has been notoriously criticized for questionable parking planning, affecting all stakeholders, including administration and students. Christianson assures the parking issue is exclusive to the university and not The Reach’s concern. It is left to see how TRU will address the parking dilemma; nevertheless, there’s a chance a negotiation between the university, developers and strata council will occur in the near future.